Hey everyone, sorry it's been so long since I've posted, things have been a bit crazy, so crazy I'm only going to be posting every few weeks instead of bi-weekly. 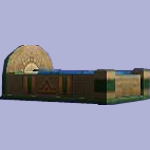 So, let's continue where we left off, crafted housing in Azteca. 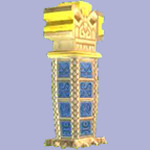 This post I'm going to cover the Dino Pillar, Magic Mirror, Spirit Caller Drum and Dino Bed. As before, you can visit Cantares Five Flowers in the SaltMeadow Swamp for all of these recipes (or already have them). I love this bed! Isn't it just so cool? I make a lot of guest rooms for my friends and it's so nice to have options. This bed will set you back 40,500 gold and 20 Perfect Jade, 8 Stone Block, 10 Water Lily, 4 Golden Pearl, 6 Sandstone, 2 Fossil and 2 Turquoise. 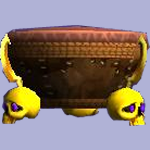 Make sure to check out the bedspread, I love all the little details added to housing objects. These decorations could be a neat addition to your home, it's not something that you see everywhere, in fact I don't think I've ever seen one in someone's home and I bet they could be really cool now that there's castle magic! 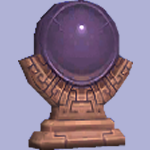 This will cost 38,250 gold and requires 1 Reliquary(tc), 1 Tempest(tc), 25 Perfect Onyx, 25 Perfect Sapphire, 5 Sandstone, 5 Sunstone, 5 Black Pearl and 5 Aether. I'm sure you're very familiar with this recipe as this item is used to make every tapestry to Avalon and because it's required for a crafting quest you most likely already have it. If not, visit Koyate Ghostmane in Zafaria and he will help you out. This recipe is a bit more difficult, it needs 4 Legion Shield(tc), 2 Perfect Onyx, 2 Pristine Vial, 9 Sunstone, 14 Black Pearl, 8 Golden Pearl, 13 Aether and 2 Conga Drum. This recipe is from Gearwise in Celestia and costs 4,755 gold. Sometimes youcan get lucky and find one in the Bazaar if you keep an eye out. Not so fortunite or need it for the quest? You'll need to make two, so amounts are doubled: 4 Giant(tc), 4 Amethyst, 2 Crystal Vial, 8 Aether, 16 Shell, 32 Fossil and 8 Scales. I personally don't see much point in pillars or columns, it seems like my ceiling is never the right hieght. If you've found something handy or cool to do with them I'd love to see! For 33,750 gold and 4 Colossus(tc), 25 Shadow Oil, 20 Perfect Sapphire, 8 Stone Block, 10 Sandstone, 5 Sunstone, 2 Golden Pearl and 1 Fossil each you can make your own to play with. That's all for this post, catch me again next month for the next post and four more items. Happy crafting everyone!